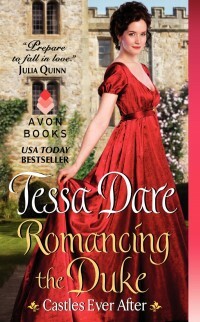 This entry was posted in Dukes, Writers and tagged avon addicts, blind hero, book review, Castles Ever After, dukes in romance, funny historical romance, hero duke, heroine writer, historical romance, LARP in fiction, mainstream romance, musing on fans and fandom, power of fiction, reader shame, romance conventions, romance fiction, Romancing the Duke, romantic ruined castle, spoofing gothic novels, Tessa Dare. I just couldn’t get past an 19th century heroine named Izzy. I did something I rarely do…….I returned it to Amazon. Interesting — I admit, I didn’t love her nickname. One definitely has to be willing to enter a slightly outlandish fairytale world that’s more than a little ahistorical…. sorry it was a DNF for you. I am grateful you stopped by to read my review and comment!